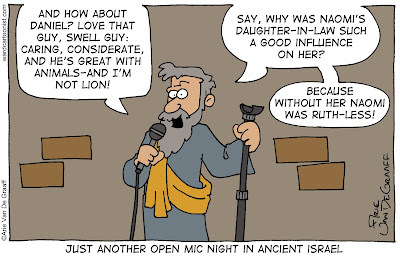 Several months ago, I published a gag featuring the worst stand up comedian in all of ancient Israel. Today I'm bringing him back. What does it say about me that I thoroughly enjoy coming up with these groan-worthy "jokes"? I'm serious, I think I might have missed my calling in life. If I had been born eighty years earlier, I might have been Henry Youngman or Milton Berle. And if I'd been born 3,080 years earlier, I might have been the guy featured in today's comic. ...bring this guy back again. Are you kidding? With my level of joke writing, you can be sure to see him again. I'm glad you figured out a way to get a Naomi/Ruthless joke in there! I could never quite figure that one out! Hahahaha! 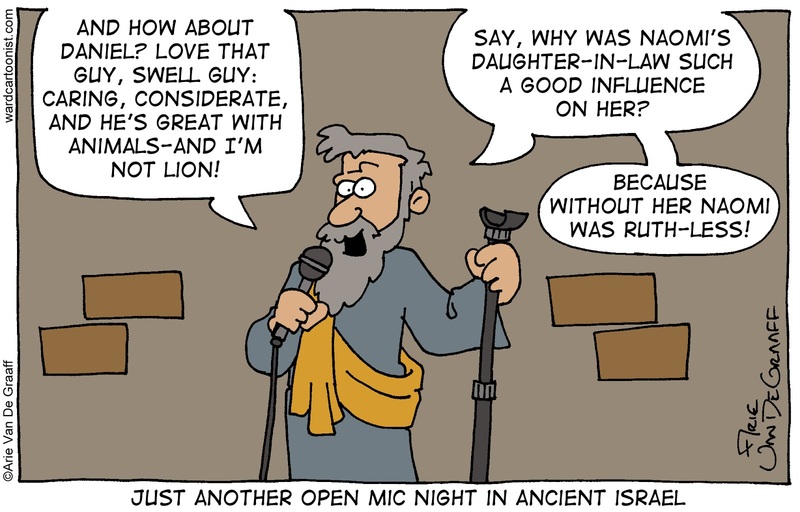 Ancient Israelite stand up comedy you’re a real church genius!